What is a Manufacturing Control System? What is a Manufacturing Control System? A Manufacturing Control System (MCS) model visually expresses the design of any ERP system. Each component of the model represents an area of concern, for example, inventory, purchasing and bill of materials (BOM). Many of the components of an MCS are directly reflected in different areas of functionality of an ERP System. 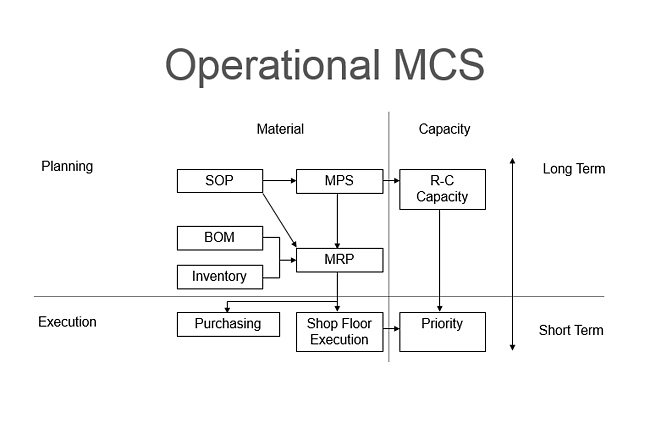 Let's take a look at an Operational MCS model, and we'll explain how it's organized. 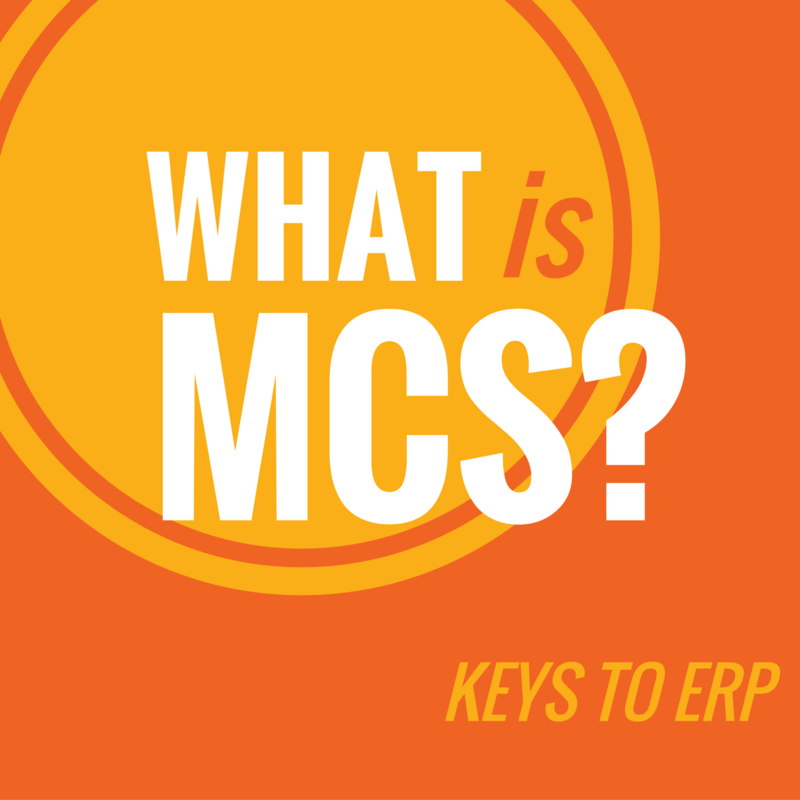 Remember, MCS is the model on which your ERP system is built. Horizontally, the model is split in into two areas: Material and Capacity. Most ERP systems have grown from a Materials Requirements Planning (MRP) system and are primarily material oriented. This is unlike others (i.e., Exact Software’s Job Boss, Infor’s Visual Scheduling, etc. ), which are capacity oriented. You'll notice each level of material planning in the MCS, however, has a corresponding capacity component. Is your operation primarily capacity or material oriented? If you choose and implement ERP based on the way you already operate, you're more likely to get what you need out of a system and ultimately reach your business objectives. Vertically, the model represents different levels of aggregation and different horizons of time. The top of the model is concerned with longer periods of time within the Planning phase. The master schedule for example, must extend to the longest cumulative lead-time for your products. The further out this lead-time extends, the more summarized the plan is expressed. The schedule may be in weeks in the short term, months in the middle term, and quarters in the long term. The bottom of the model is only concerned with the immediate schedule and extends out only a few to several weeks, depending on your situation. The bottom of the model focuses on the Execution phase. Every manufacturer knows just how important it is to balance immediate scheduling with long term and master scheduling. The model above, as well as your ERP system, help you stay on top of all the variables that must be planned out to ensure quality products are delivered on time and inefficiencies are minimized. The Manufacturing Control Systems model is effective because it allows for the use of three competitive weapons: Material, Capacity and Scheduling. Best practices use the proper mix of these weapons depending on the manufacturing environment. Stay tuned for my next post in which I'll go over another Key to ERP: your manufacturing environment. This Key to ERP is one of three that will introduce you to the APICs Body of Knowledge. APICs, the Society for Operations Management, provides the foundational principles on which MAX is built. Our hope is that by understanding some of the APICs principles you'll get more out of your ERP system.